Lightsleepers MC from lightsleepers on Vimeo. We got that good hook up today. 30% off all shirts & hats. 15% off all records & cassettes. Lets keep it moving into the new year. Thank You for not Sleeping. Anybody remember that movie with Tom Selleck, yes the guys who played Magnum P.I., the one with the robot bugs taking over the world. RUNAWAY. For some reason that movie came to mind as i change over from our past online/instore/remote to the current. Please bear with us as we work out the bugs. Word to Magnum, Higgins, TC, and Rick. Stay Tuned & Don’t Sleep. Time keeps on slipping into the Future. 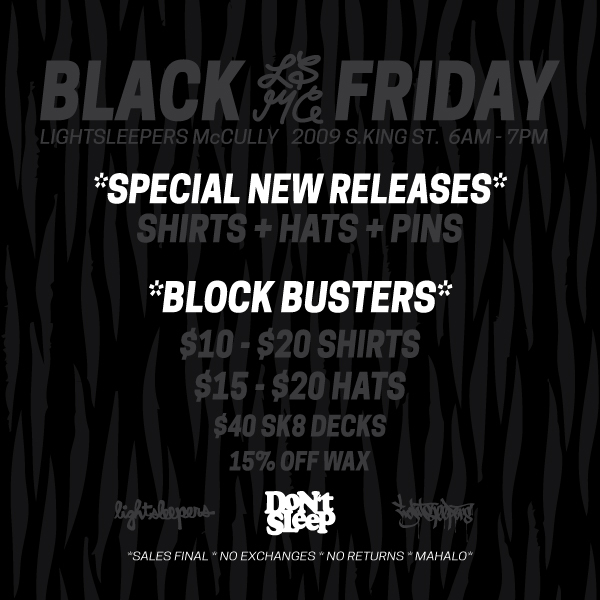 Its Black Friday and we hope you can stop on in to check out our new releases: Drips, Scripts, & LSMC “The MC” Akira Shirt. We got that $10.00 shirt rack & $15.00 + Hats. Can’t forget our Glow In The Dark – “Don’t Sleep” Pin is Trill, haha. 2009 S. King St. 6am to 7pm. Thank you for not Sleeping. If the Black Friday wasn’t going to be nuts already, we are having Award Winning Sculptor, J*RYU at the LSMC. He will be bringing with him his newest KidRobot 8″ Dunny, “It’s a F.A.D.” Also posted is Cosplay royalty, Vampy Bit Me and LS Ohana, Angry Woebots. Woes pre-party is 5 to 7 & J*RYU x VAMPY there after. Don’t Sleep. Its been a great opening week and to top it off Del the Funky Homosapien stopped in to check out the shop. Mahalos to Shingo2 for bringing em by. Some might know DEL as the leader of Hieroglyphics outta the Bay Area. Others might know him from Deltron 3030 or his most known project The Gorillaz. What an Honor. Lets see what this next week, month, or end of 2015 will bring. Just awesomeness awaiting. Don’t Sleep. …And God said there shall be Light. Would be dope if he said, “Lightsleepers” but aye ill take just the Light. We opened a retail shop, a brick and mortar, a stand alone shop not in the Mall! I would of love to say that the journey was long but it was a blitz. I knew a LS shop was somewhere in our future, but not this soon. Well God had different plans and he blessed us with this great location. We are located 2009 S. King St. next to Truest Hawaii & MONO. Here is a cool photo dialog shot by Marvin Taeza. Stay Tuned & Thank You for Not Sleeping. We are opening up tonight! 9pm to Midnyte. I was asked why, “Thursday” and why, “9-12”. For the new heads, this exact time of the week was when i first started my radio show on KTUH 9.3fm. The birth of Lightsleepers. Never in my wildest imagination i thought that i would be opening a shop. Fast Forwar 18+ years later and here we are. Thank you for all the support. Hope to see everyone at the shop. Mahalo and Don’t Sleep.